Some of you may know we recently visited California to see family and having visited many times, I know how hard it can be to eat out for a vegetarian as everything there is mainly geared up for meat and fish eaters and they really do look at you as if you have two heads if you say you don't eat meat - even though California has a wide variety of food from so many different cultures and heritages. 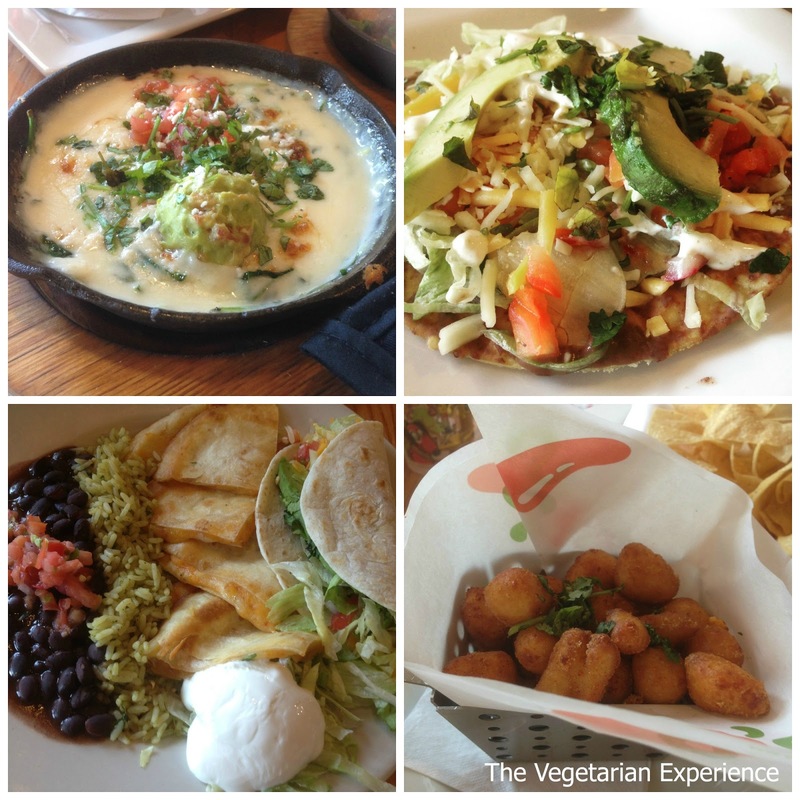 Today I just wanted to give you a sample of the delicious food we sampled during our visit to prove that vegetarians can eat well in California! We flew American Airlines to LAX from London. Plane food can be notoriously dodgy, especially for vegetarians and so and I was pleasantly surprised to find they had a vegetarian pasta on offer both ways as one of the choices. I had ordered a veggie meal which basically consisted of stewed vegetables, but I quickly swapped it for the pasta which was delicious. A vegetarian panini was offered as a snack shortly before we landed in LAX and granola with blueberry yoghurt was served on the leg back to London shortly before landing in London. We stayed in Orange County, about 40 miles south of LA. The first morning, we ate at our hotel - Hotel Irvine, which I would definitely recommend if you are in the area. The food was amazing. A light buffet breakfast was on offer (coffee, juice, yoghurt, pastries) and then you could order from the menu too which was not too expensive. We ordered egg rancheros for breakfast which was absolutely delicious. The concept of being able to eat something that a fried breakfast was a little lost on the kids, but we thoroughly enjoyed the change! Lunch took us to California Pizza Kitchen, where the kids ordered delicious pizzas and I ordered the Caramelised Peach Salad which had cranberries, gorgonzola, toasted pecans and red onions and of course the peaches served on a bed of greens. This dish was one of the food highlights of the trip as it was so delicious and unlike anything I have had in the UK. I am definitely going to try and recreate this salad at home as it was so delicious - although I'm sure the peaches won't be as fresh as they are in the sunshine state! No trip to the USA would be complete without a visit to Denny's Diner for breakfast. I thought I remembered there being more vegetarian options on the menu, but it seems I was mistaken. There wasn't huge amounts of choice, but I opted for a cheese and tomato omelette which was ok and the hashbrown potatoes which were really yummy! Then there is Del Taco! Our family is a huge fan of Mexican food. We virtually ate Mexican at some point every day whilst away. Although Mexican food in the USA I'm sure does not hold a candle to authentic Mexican food from Mexico, it is a million times better than many of the lacklustre chains you find in the UK with disappointing versions of Mexican food. Enter Del Taco. We found a really nice, recently refurbished Del Taco where you could get a reasonably priced meal which was freshly made. Although I forgot to take pictures of the food (the food was so good we ate it before remembering to take pictures!) Our regular order included the 8 layer Veggie Burrito, Spicy Jack Cheese Quesadilla and Fries - which were the best I have tasted in any fast food restaurant. Eldest also loved the bean and cheese Burrito. We love Del Taco for a quick and easy meal. I think it's much nicer than Taco Bell and a great choice for fast food for Vegetarians as others - In and Out, Carls Jr, McDonalds etc don't always have as much vegetarian choice. A trip to Newport Beach cannot be forgotten, along with their awesome Balboa Bars - the delicious ice cream bar delicacy native to the bay of Newport - which is literally one of my favourite places in the world. We enjoyed our Balboa Bars as we watched the yachts sail along the harbour and took a ride on the Ferris Wheel. As a big fan of the tv show "The OC" in my late teens/early twenties, it just reminds me of a simpler time when as a single gal I could "hop across the pond" to California anytime I wanted to visit family and chill out at Newport Beach. We were lucky enough to enjoy traditional American Hospitality when we went to a Memorial Day BBQ at a local church. It was a bring a dish policy and the offerings were absolutely immense! I have never seen to many different salad and pasta dishes, not to mention the unbelievable cupcakes which the kids soon got stuck into. Funnily enough there were no veggie burgers on offer - it was a meat fest on the BBQ - not room for anything vegetable related! However, I didn't go hungry as there was so much other great food to sample. Our lasting memories of the day though are the kids taking part in a watermelon eating competition. Youngest had a brilliant time and I loved seeing her playing with other children and having fun. Another regular stop when we are in SoCal is Jamba Juice. A little "passe" these days for some, a few years ago, a visit to Jamba Juice was "the" thing to do and the queues would often be out of the door. Our regular Jamba Juice had closed down, but we did find another outlet, and enjoyed a delicious juice from Jamba whilst we soaked up the California sun. Next stop Rubios - a slightly more upmarket version of Del Taco I guess. Serving "coastal inspired cuisine, Rubios is very fish focused. However, I did manage to find a Veggie Burrito. Nachos and quesadilla, along with some delicious black beans which we found really tasty. Youngest has also begged me to mention "which wich" a sandwich shop where she ate from whilst we had Rubios. She loved it as she got to pick a bag and tick what type of sandwich she wanted, what bread and fillings,and then watch the bag go along the line and be filled with her sandwich. I love the idea of this, so I think we will all be visiting next time! As some of the main courses were not specifically vegetarian, I think that Chillis was very accommodating in allowing customers to make their food veggie. I love Chill's as I think they are really vegetarian friendly and we will be back next time we visit! Other food highlights included a trip to Panda Express for Chinese and lots of other places. Although California is very meat and fish orientated, I think it's easy to eat Vegetarian if you know where to look and hopefully some of these have inspired you to take a look if you are ever in that part of the world. 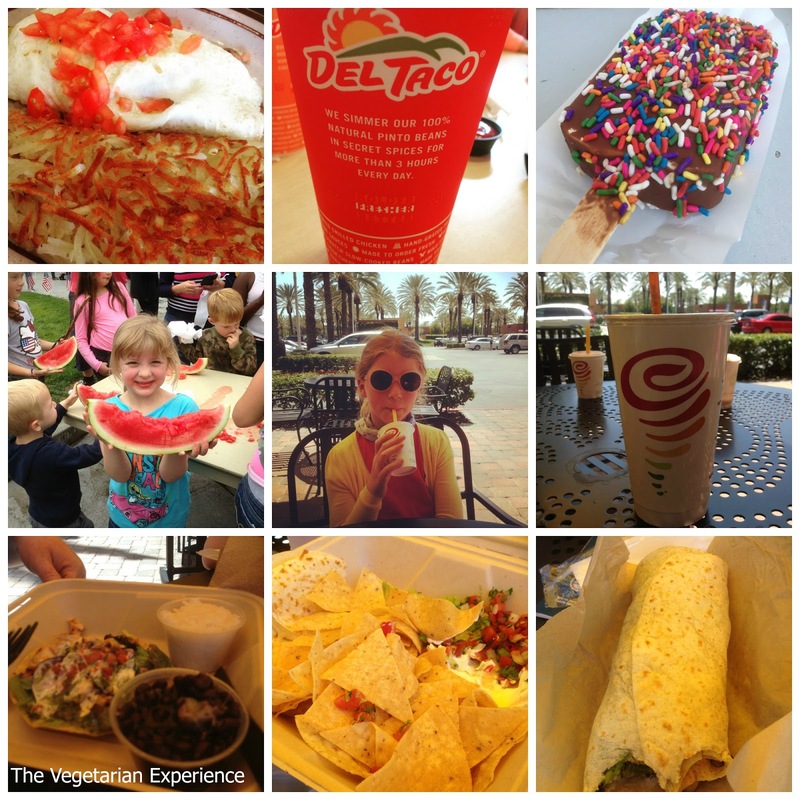 What's your favourite place for vegetarian food in Orange County? Do you have any good tips for me for next time?